I used Nanny Poppinz™ to take care of my infant twins while I was on a two day trip. While I was 500 miles away the Nanny called to tell me that she wasn't feeling well. The situation escalated to the point where she had to call 911 for help. However, she had the presence of mind to think of my children's needs during this time - and called her 19 year old daughter to take care of the children so that they would not be left alone. Her professionalism during her personal crisis was outstanding. Obviously she was not available to care for my children for the second day of her tenure, but Nanny Poppinz™ customer service (National Call Center) stepped in and found an outstanding replacement within a couple hours time. I am beyond thrilled that I had this service available to me...I will definitely use you again. We have never looked for a Nanny before and Yvette walked through the process and explained everything to me! I never could have figured all the details of hiring a Nanny without her! It was great to have my 'hand held' through this process and well worth the agency fee! We are very comfortable with the Nanny we've hired and very excited to have her working with our children! As this was my first experience with a Nanny service I do not have anything upon which to base a comparison but this Nanny service has been exemplary! Hilary was a great Nanny. The baby actually looked better when I came home than she did when I left her. I was really pleased with the whole experience. "I have been very satisfied with your services, and the temp Nanny's we have had in our home have exceeded our expectations." Yvette knows how to handle busy moms and she is so friendly and approachable. It's like having a fellow mother that you can talk to about your parenting concerns. She's just great support and so professional at the same time. Excellent work! My children and I loved Danielle. I've never seen my kids so happy after a visit with a Nanny. Thank You! 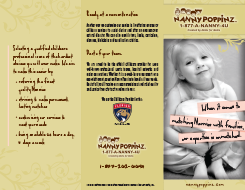 This was the first time our family has used Nanny Poppinz™ services, and it was seamless and invaluable. Thank you for providing such a great resource for our area, you are the only business providing sick child care on the Peninsula! I have already recommended your business and will be continuing to do so to other working military/DoD civilian families. We used your service to find a babysitter for a night when on vacation out of town. Our babysitter was great and the kids really liked her! She was very safety conscious and followed all of our instructions. Great job from the Nanny and Nanny Poppinz as we were nervous about utilizing a new service for the first time. Such a great service!! You guys helped us so very much!! Our Nanny was wonderful! I really could not have asked for a better individual to watch my litttle one! Thank you for quickly finding a Nanny to take care of my son last minute. You saved my day!! She was great!